There are some days that I don’t want to leave my house which becomes an even worse scenario when there’s nothing to eat. Enter Food Delivery. As of late I’ve been using Bite Squad whos service can be spotty but I was starving. Burbowl Juicy Smashed Burgers had caught my eye a few weeks back so when I saw their name on the app it was a done deal. I really was torn on the Single or Double meat option but decided on the Double since it’s a smashed patty which generally means a smaller Burger. They were out of Juicy Doggies so a Juicy Grilled Chicken Sandwich was in order along with some Juicy Loaded Fries. The Fries were interesting since there were three varieties of Fries in the order: those Fries with the crispy exterior, Waffle Fries & Curly Fries. I like the idea of it but I should have skipped out on the Bacon and added one of their killer sauces, more on that later. This was a perfectly and seasoned Grilled Chicken Sandwich to which I added Caramelized Onions and some of the Secret Juicy Sauce. I didn’t ask what was in the Sauce but there is some heat in there, I’m leaning towards a Jalapeño Cream type Sauce. I wasn’t expecting much but when I opened the container my eyes lit up, it was beautiful. The Burger had a really nice meat crust on the outside of the Patty, whoever cooked this knows what time it is. 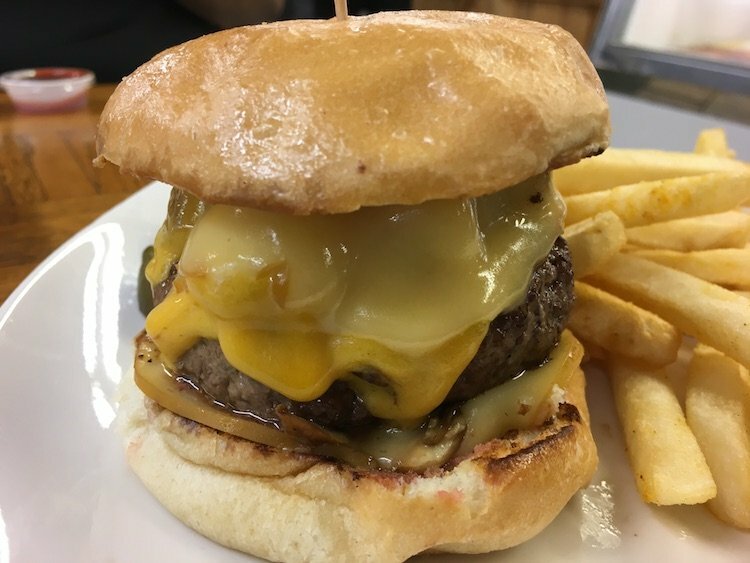 I chose American Cheese, the Juicy Secret Sauce and Potato Roll as the vehicle to carry the meat (Pretzel Bun & Lettuce Leaf are options too). I couldn’t leave well enough alone and I also couldn’t get Burbowl Juicy Smashed Burgers out of my mind so I paid a visit to the actual store in Downtown Miami two days later. My plan was to be a little more civilized this time around and try the Single Burbowl Juicy Smashed Burger, try the Juicy Doggie and get some Fries w/Cheese and one of their Sauces. Yup, it was just as good if not better then the one I had earlier (same choices on toppings). I do prefer the Double version but remember I’m a meaty kinda guy. The truth is I ate the entire Juicy Doggie before I took a stab at the Burger. I saw Corn was an option and I figured, why not. Well, I’ll tell you why….it was Cold (the Corn not the Dog) and threw off the entire Dog for me. If I had a do-over, I’d have a Juicy Doggie with Cheese Sauce, Grilled Onions and the Garlic Chipotle Sauce. I didn’t mentioned the Garlic Chipotle Sauce only because I hadn’t tried it til I made my way to the Cheese Fries. It was pretty addictive and goes well with the Burger who ended up being dipped into it. On the Fries sides I love the idea but since I’m not a fan of those Fries with the crispy exterior, Yuca Fries will be ordered the next time. If you’re anywhere near the vicinity or can get this Burger delivered to you, do it. I can’t imagine a world where you wouldn’t love it.